I am originally from a city not far from Warsaw and both my parents are Physical Education teachers and I grew up practicing and competing in majority sports which led me to study at the Academy of Physical Education. I am currently studying a degree in Psychology, which I commenced in New York and hope to finish a Master’s diploma here in Warsaw. 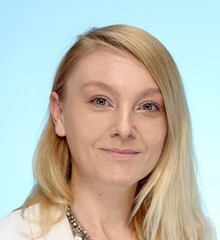 I started as a Receptionist at the British School Warsaw in 2018, and have moved into the Admissions team as an Admissions Assistant. It has been a joy and a privilege to work in such friendly environment. Before returning to Poland, I spent several years in New York and had the opportunity to learn about and experience a mix of cultures and really enjoyed living in such a vibrant city. As an Admissions Assistant, I really enjoy meeting new families and helping them with the important decision of choosing the right school for their children. I love to travel and am enjoying exploring Warsaw again. I also enjoy good music, books and films and my favourite sports are tennis and volleyball. See first-hand what The British School Warsaw has to offer!